George Galfo, second tenor and one of the founding members of the original Mystics, is also the only original member that is heard on all the recordings found on the 16 Golden Classics album. George Galfo looks back with pride as he continues a new chapter. In keeping the music alive, George has formed his own celebrated group. Joining George are Mike Miller ( former lead singer of Harmonystreet), Joe Neary (former First tenor of Reunion and Bits and Pieces and who can be heard as the first tenor on Dion's last two recordings), and Joel Starr (The Five Sharks, The Excellents, Risky Business and Goodfellas). The sound of George Galfo's Mystics harbor the soft breezes of harmony perfection. 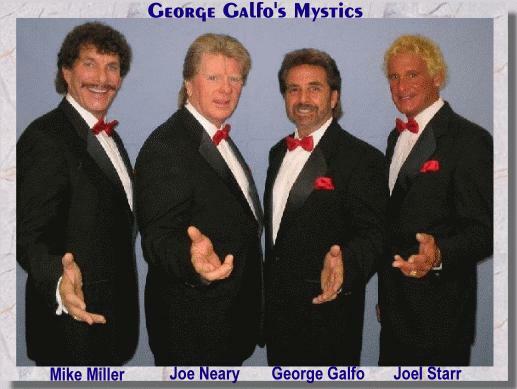 You will find more information on George, Joe, Mike and Joel along with the history of the original Mystics on their official web site. July 2005 - I hope you all will join us in welcoming the newest addition to George Galfo's Mystics - Joel Starr. You can find out more about Joel at George Galfo's Mystics website. We are sorry to see Shelly Brill leave (for personal reasons). We'll miss you Shelly!